Making Moroccan mint tea is a matter of 15 minutes. It essentially is Chinese green tea (gunpowder) infused with lots and lots of fresh mint and sweetened. A touch of sugar sweetness is very important in the taste of this tea. Sugar is traditionally added to the pot, not to each tea cup individually. If while reading this you were thinking that you would skip adding sugar for yourself, you are of course free to do so. I can just say that it is very much worth trying it the original way (sweetened) at least once. You might be surprised. Stuffing the dates takes a bit more time, but it still isn't hard at all. You just need to blend the pistachios with icing sugar, some melted butter and rose water. The scent of rose is an important part of the magic. Once I got my first bottle of rose water I started to use it more and more and I'm incredibly happy with this finding. It should normally be available from bakery stores or Asian/Middle Eastern speciality stores (in Moscow - from Indian spices store). Bring the water to a boil. Heat your teapot and serving cups or glasses. Pick leaves from 2-3 sprouts of mint and place them into serving cups or glasses. Place the rest of the mint together with the stems into the tea pot. Add the gunpowder and sugar. Pour in the hot water and let infuse under lid for 3 minutes. Pour into the serving cups and serve (goes really well with the stuffed dated described below). Roughly chop 5-6 pistachios and set aside for decoration later. Process the rest of the pistachios together with icing sugar, till you get quite a fine powder. Pour in the melted butter and rose water. Process again till you get even paste. It should be quite soft (easily squeezable out of a pastry bag). If the paste is too thick, mix 1 tea spoon of water. Transfer the paste into a pastry bag (preferably with a star tip) and fill each date with the paste. 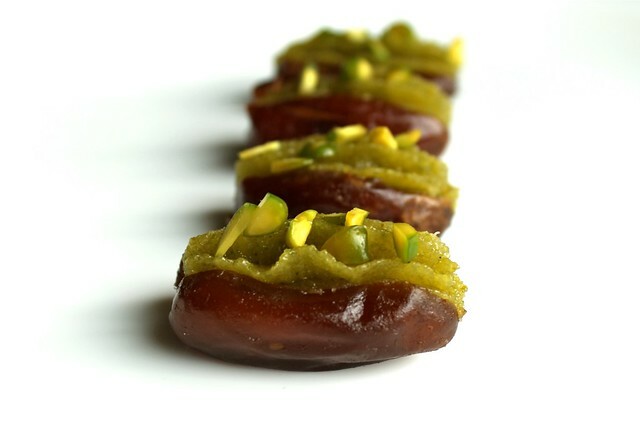 Sprinkle with chopped pistachios and serve along the mint tea. If you make them a bit in advance and let them stand at room temperature (for a couple of hours or up to one day), they become even better. My best friend from childhood was moroccan, whenever I visited her, her mother would make us the typical tea. *sighs* Childhood!! 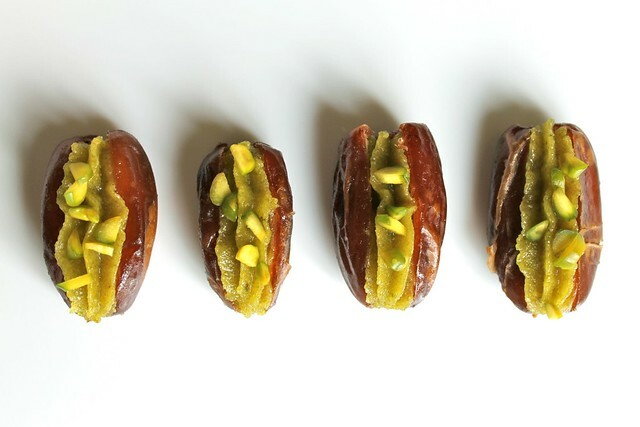 Though I never ate dates like that, this sounds most delicious! I will need to try it out soon! oh, wonderful! would be great to find out how they taste to you!